Okay, I'll admit it. I'm addicted to making ball ornaments this year! It's just so simple and there are so many variations! You can fill glass ball ornaments with yarn, twine, feathers, fake snow, pine needles and random craft supplies. You can also fill them with paint! It's so easy to do.All you need is a clear ornament and your favorite acrylic paint.I'm really loving Martha Stewart's paint line. It is full of so many gorgeous colors and shades. Be sure to start with a small amount of paint. If it doesn't coat the inside entirely, you can add more as you go. Adding too much at the start may slow the drying process. 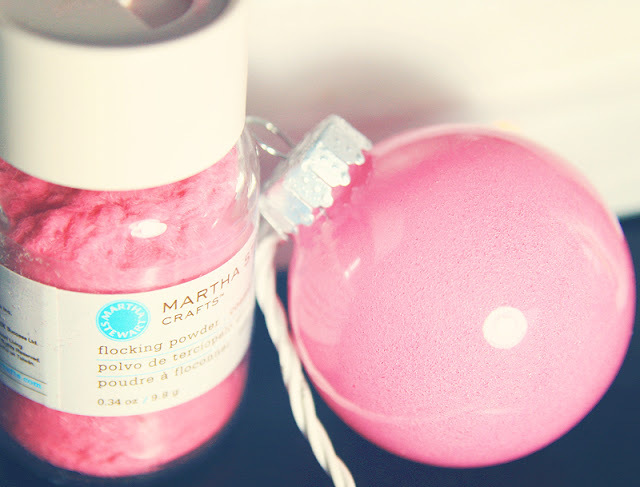 I also tried filling with Martha Stewart's flocking powder. It leaves a nice, cotton candy-like texture. I used some varnish to coat the inside of the ornament first...to give the flocking powder something to stick to. I got a little carried away with the paint selection. I tried glitter, satin, high gloss and pearl. Each makes a different, yet gorgeous effect. What are you filling your ornaments with this year? Your DIY ideas are adorable, I love the flower cone! I'm starting a new wedding blog, The Handmade Wedding, along with my husband, and we're looking for DIY contributors for the blog. It's set to launch on New Years Day. You have been sharing the most wonderful ornament tutorials! I love that blue, and the orange -- fabulous! thank you! :) when I first saw Martha Stewart's paint selections, I about died! So many gorgeous shades!! Thank you for sharing these easy decoration tutorials! I like the candy sprinkle ball the best! And also the painted pearl. Ohh, I love those ideas and I totally want to make them too. Sending it over to my friend right now:) Muah, sweetie. These are super cute! You are talented with awesome creations! I love the candy sprinkles! did they go bad though or will they last and not get moldy? I love it though! If you dont want to use candy sprinkles, i would think you could use glass seed beads. ive been trying to make an "ornamenterrerium" but i haven't been able to find the same basic clear ornaments with a removable top that you used here. any suggestions? ive tried rite aid, duane reade, a small christmas dedicated shop, bed bath and beyond, home depot.. Craft shops like a.c. more, Micheals, Hobby Lobby. love them!!!! btw....how did you do your nails?? i love them!! These are so gorgeous. i love, love, love the one with the sprinkles. I absolutely LOVE the rainbow sprinkles ornament! It's really adorable. I just love these ideas! I'm your newest follower :) Sharing this on my FB Page! Aaah, I LOVE these! All of them but especially the candy sprinkle one- what a fantastic idea!! So pretty! Did you have any trouble with the paint not sticking to the glass? I tried this (with a different brand of paint) and ended up with streaks/cracks as the paint dried. You can also swirl some alcohol inside the glass ball before adding the paint. Just make sure you let it dry before beginning. It helps to clean/prep the glass for use. Such cute ideas! Also, your nails are totally cute. CUTE ideas!!! I made 2 different ornaments using these clear bulbs with my students this year. We put legos in one and foil basket filler in the other. Just a couple other ideas. Such a great tutorial! I honestly never knew it was quite so simple to make these. Next year is going to be so much fun with the little one! Thanks for sharing. congrats on finding such a great deal! What a great idea. I might have a go at making some with my little girl. (4yrs old) It might be a laugh. Im gonna need some of these. These are the main materials i need. Gorgeous! 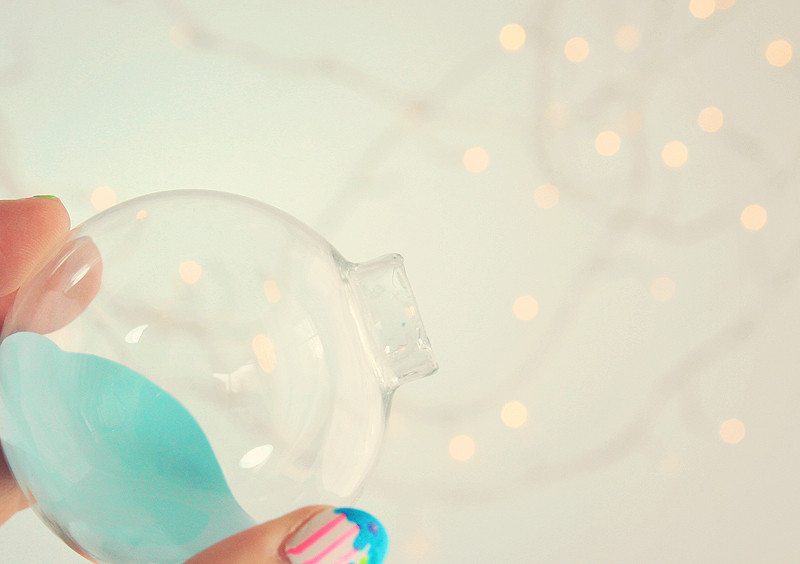 I have to know the exact method you used for the glittery blue ornament in the last picture. It's perfect! Also, what is it you have in the background in the first 3 pictures to create that white, shimmery effect? Is it a tree's branches wrapped with lights? the glittery blue effect was simple! I just used Martha Stewart's glitter paint. I really love her paint collection -- have you seen her colored chalkboard paints? Oriental Trading is a great place to purchase ornaments. Just purchased 60 for $20. Im doing a "sweets" theme on my new tree this year and these would be perfect..just need to know did you get the varnish from Michaels? And is it Anitas brand? I have pinned this on interest to keep it handy for reference i just want to are sure i get the right stuff. If you add more than one color of acrylic paint it will create a swirl affect. I personally like red, yellow, and blue because they mix in some places to create the secondary colors. Back "in the day", before you could find purple ornaments everywhere instead of just Bronner's & the expensive stores, I made some with different colors and swirled them.. I just took them out last night and they still look great... they have to be at least 15 years old. They are some of my favorites. I HAVE to do the candy filled one LOVE it!! If you did a bunch in different sizes and hung them on a white tree, it'd be super cute! These are incredible!! What Martha Stewart color is that first ornament? 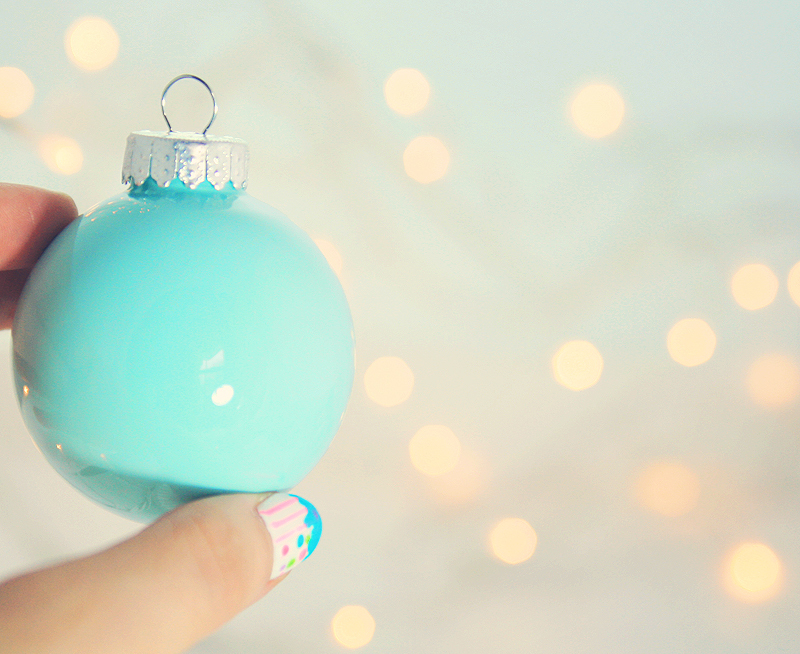 I love that color it looks like Tiffany Blue! 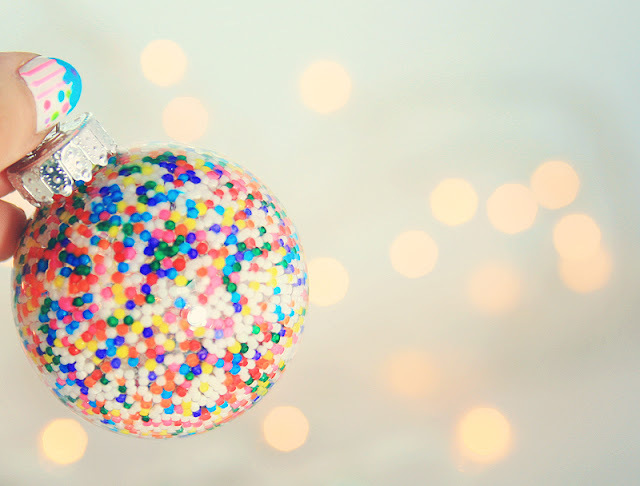 Do you fill the ornament full of sprinkles or just enough to coat the outside?! Popping popcorn in the bulb in the microwave is a great one too! I LOVE this! Definitely on my holiday to do list! Pinning! I am going to feature the candy sprinkle photo in a round-up. It will go live in a couple of days. It will be a thumbnail of your image and a blurp (aka description of your brilliance) with a link leading back to your site for credit. If you do not want to be featured email me back. I'm having a hard time getting the paint to dry! How long is it supposed to take? I am using Martha Stewart glass paint but it thins out so much after dripping out. i let mine sit for 24 hours! Such a great idea!! 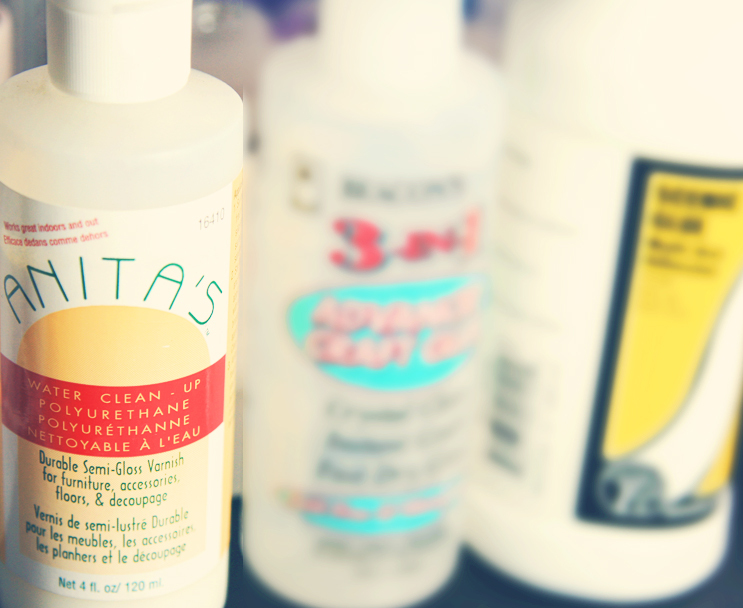 I love it~ By the way, I am having my 2 year blog anniversary giveaway. I am giving away a Deborah Lippmann nail polish and a golden star necklace. Come check it out! When using the varnish, did you pour the excess out before putting the flocking powder or sprinkles? Thanks so much for sharing - I LOVE it! 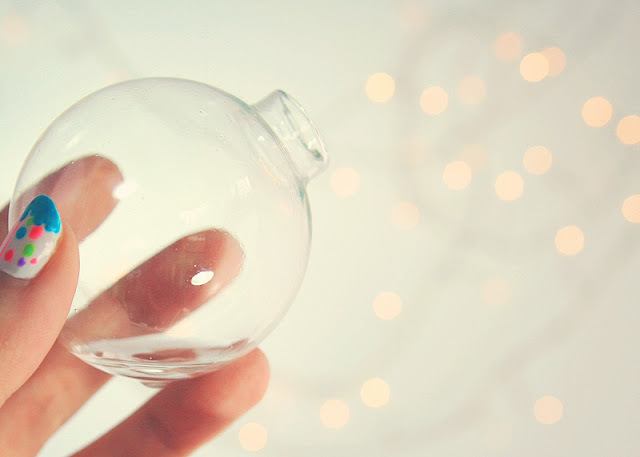 We've linked up to you in our post "Clear Ornament Inspiration." I did this - and after letting the ornaments sit inverted overnight - there was still a bunch of excess paint dripping out! I tried to shake it out - but its so thick and slow dripping - not sure it is all out! So I guess I am not sure if it will actually dry inside? I am wondering if there is anyway to MAKE it dry - like Shellack? I am a little worried I have created paint bombs - because as we all know with kids and dog - ornaments do break from time to time. Also - the openings are quite messy/clotted with paint. I am not sure the silver opening will go back in well...did you have this issue? the openings, i wiped down with a baby wipe. if the paint is dry on the opening, you could sand it off before adding the cap back on. for drying it quicker -- if there was too much paint inside, it could take longer. keep letting it drain out on it's own. You can also try propping it in it's ornament tray and using a hair dryer on it's lowest setting. hold it a few inches away from the opening. I just tried the sprinkles ornament and ended up with a brownish clump of broken down sprinkles on the inside.....what did I do wrong? 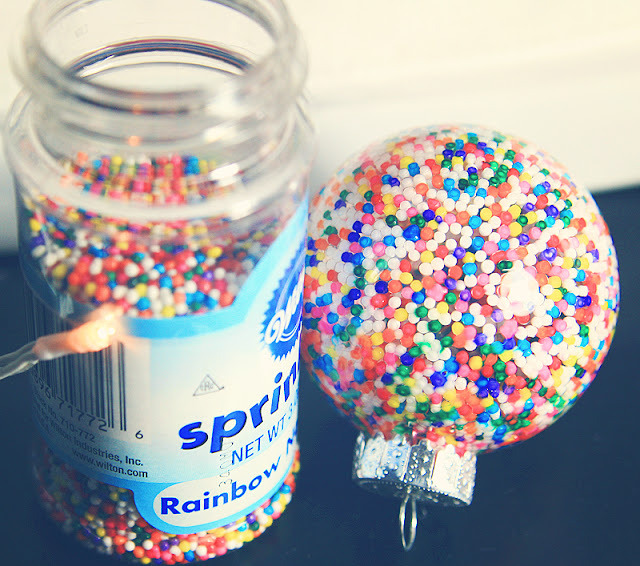 I attempted to do the sprinkle ornament, but was not able to get the glue to cover the entire inside of the ornament. I used a small paintbrush to swirl it around, but the paintbrush couldn't get to the middle. How did you get the varnish all over the ornament? Loved seeing this idea! I actually did something very similar a few years back and gave them as gifts - very well received. A great base for draining the ornaments is an empty egg carton. It will hold several at a time. A cute ribbon tied onto the metal loop adds a nice touch. Thanks for sharing this - I love your creativity! Hello! This tutorial is absolutely adorable. Could we feature a photo of it and link back to your site on a round up for Babble Home? You can email me for more info at Colleen@prettyprudent.com. Thanks! These are so cute! I'm so doing them. And you're nails are really cute too! I really like this shade of blue. What is it called exactly? I LOVE the sprinkle ornement! I'm definitely making this! Last year I made some with varnish and glitter inside, on the outside drew snowflakes with a white marker. Do you have to use varnish or could you use something like modge podge? Also, would this still work on plastic ornaments? I have a little hyper puppy and want him to be safe! The varnish is just to help it stick. Mod podge might be more difficult to apply since it is a much thicker coat. 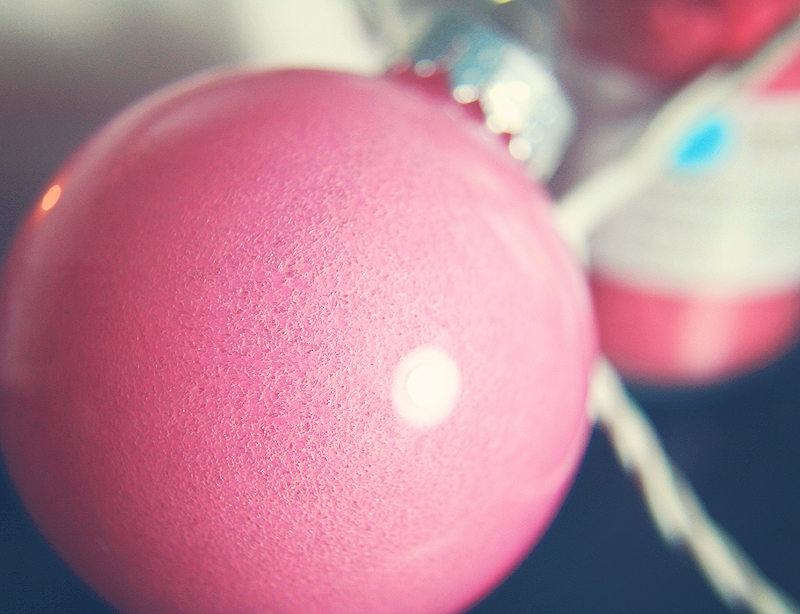 But if you're going with the plastic ornaments, the acrylic paint should stick fine on it's own. You may want to just swirl some rubbing alcohol on the inside and let dry completely before applying paint. That will allow it to clean any factory dust or slime to be sure the paint will stick. Good luck! These are such pretty ornaments!! 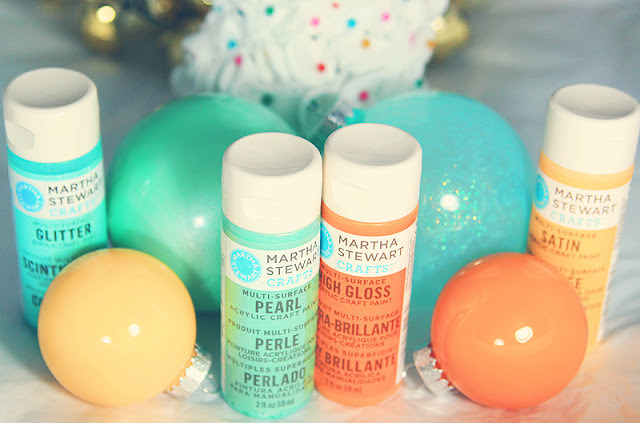 Did you have to thin the Martha Stewart Pearl Paint at all in order to coat? I tried with water (plastic ornaments), and most of the paint has slid out in the drying process..